Sri Lanka's Buddhist heritage is nowhere as evident as in the Golden Temple of Dambulla, a UNESCO World Heritage Site. 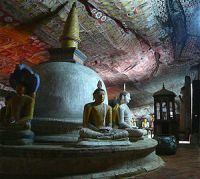 A sacred pilgrimage site for 22 centuries, this cave-temple is the best preserved of its kind in Sri Lanka. The temple encompasses five separate caves, each housing ancient statues and artwork of the Buddha. The statues vary in size up to 50 feet (15m) tall and there are also incredible painted murals on the walls. The largest cave, the Cave of the Great Kings, holds 56 statues, and others dedicated to Hindu gods such as Vishnu and Saman dating back to the 12th century. Another cave has more than 1,500 paintings covering the ceiling. The temples and caves are one of Sri Lanka's most spectacular tourist attractions, and are attached to a functional monastery dating back to the third century BC. The site also includes evidence of human occupation going back to the prehistoric period. Lots of monkeys frequent the temple complex and they can be cute and entertaining, but tourists should treat the animals with respect as they can and will bite if they feel threatened. The climb to the caves can be tiring, especially in the heat, and may not be manageable for people with mobility issues.